With 1,352 Kindle pages, this French phrasebook and dictionary has more than FOUR TIMES as many pages as the next biggest one. In fact, it has more pages than the next 8 Kindle French phrasebooks combined. 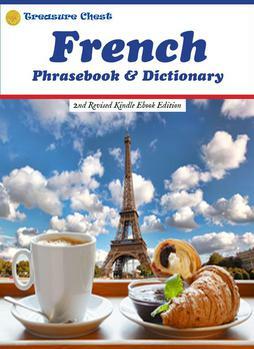 This is not just a phrasebook for taking a taxi or buying toothpaste - it’s a phrasebook for communicating with people; for expressing your wants, needs, ideas and problems; for making friends and acquaintances; for having fun and playing sports; for learning about French culture and enjoying French cuisine; and for dealing with a wide variety of situations. And not only is this phrasebook far larger than others, it’s much quicker and simpler to find the expressions you’re looking for. You don’t have to fumble through categories, as in which category is “I need to recharge my cell phone.”? In this phrasebook you go to the main word(s) of the phrase to find the phrase. And the main words are alphabetized like in a dictionary. Seconds instead of minutes. Have questions about French grammar? There’s an eleven-page appendix that will explain all the basics. Confused about a French sign or label? There’s an appendix that lists the most common ones. Want to tell someone your weight in kilograms or your height in centimeters? Two appendices have charts for each. If you’re serious about communicating in French beyond “Bonjour!” and “Au revoir!”, this is definitely the phrasebook that will serve you the best. Order your copy today - and when you do, please confer a brief review of it. for independent travel to France.